Best described as a rural theme park minus the rides, France’s Puy du Fou is home to some of the most spectacular, extravagant shows in which thousands of actors and animals recreate historical stories, from Roman gladiators through to King Arthur, all with incredible special effects. 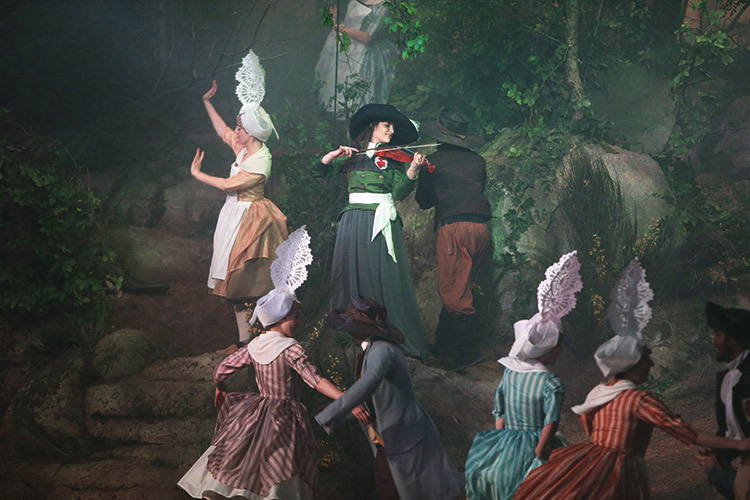 Now, Puy du Fou has taken things to the next level once again, with its new production – Le Dernier Panache, which tells the tale of François Athanase de Charette de la Contrie, who became known as General Charette. Beginning with his studies at the Marine School Guards in Brest, through to his naval battles, how his life was turned upside down with the French Revolution and his final battle for freedom during the Vendée civil war, it’s a story that encompasses courage, strength and adventure, based on real-life events. Le Dernier Panache is the most daring show ever created at Puy du Fou – and it is only enhanced by the setting. Performed in the custom-built, 360° Theatre of Giants, which utilises advanced motion technology to create a rotating theatre, the 2,400 members of the audience are immersed in the story on a multi-sensory level, slowly rotating to watch the performance on seven different stages. With such an ambitious production, the technical install proved to be challenging – with audio, lighting, video and special effects all having to be taken into consideration. The task of providing lighting was down to renowned Lighting Designer, Koert Vermeulen, along with his team at ACT Lighting, with the idea being to use the lighting to help create seamless changes from scene to scene. Koert, who has had a long-standing relationship with Puy du Fou after his work on the award-winning Cinéscénie show, planned to achieve this through careful planning, a deft lighting design and the adroit placement of fixtures, which were provided by Chauvet. Koert used all 120 of the Ovation E-910FC fixtures within the proscenium for side lighting, cross lighting, top lighting and gobo washing. The RGBA-Lime Ovation LED fixtures are used throughout the production to produce a whole rainbow of colours.An aspect of the install that had to work in conjunction with the lighting was the stage backdrops, curtains and drapes, which were provided by ShowTex – another company with 10 years of experience in working alongside the team at Puy du Fou. The specialised technicians at ShowTex were able to meet the precise, structured requirements that came with such an ambitious project, providing a realistic, unique and long-lasting install that brought Le Dernier Panache to life. To highlight the scenery and create an ambience that matched the theme of Le Dernier Panache, masking drapes made of Molton CS were hung in six scenic spaces. However, the main showpiece of the install was the giant panoramic screen, which ShowTex provided using 900sq metres of FP-SuperMat. The bottom of the screen – which is 80-metres wide and 11-metres tall – is immersed in water and hit by waves during the show, so ShowTex had to ensure that the screen absorbed the waves and stayed tight by using an open tube with curved weight pipes and a stainless steel chain. 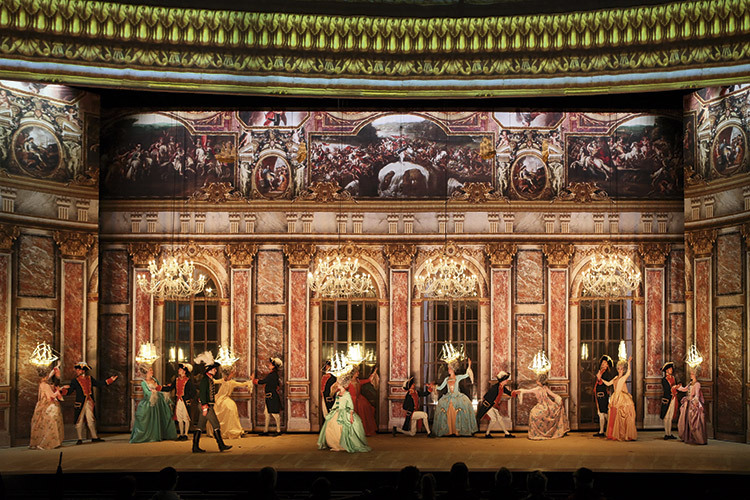 Another huge challenge for ShowTex was the life-size palace that appears once the curtain half opens, which required an extraordinary level of precision to achieve the realism. The solution from the ShowTex team was to print it on Galaxy 250 Print, with 3000 sq metres used overall. However, this was not traditional printing, with LaserVoile used as a reinforcement backing fabric to hold the elements of the cutout window. The scenic space had to be used for several scenes in the show, so two printed 200 sq metre backdrops were equipped with a HiSpeed Roll-Up 8000 system, as well as a mechanism at the back for Roman curtain opening, which was all controlled via DMX. The masking drapes and printed curtains were attached to concentric ShowTrack track, each with a length of 31-metres and coming with a built-in RTD3000 motor for easy, efficient DMX or simple cable control. ShowTex also installed an impressive technical ceiling above four of the stages for hanging draperies, printed curtains, light sources and other elements, while on two stages where the height of decorative elements didn’t allow borders, StretchTulle was used to create the illusion of a closed – but flexible – black ceiling. Elsewhere, mobile screens were needed and ShowTex were happy to provide a solution by using 1,700 sq metres of FiberCloth M0. The material was the least reflective, offering clear projected images and great flexibility. Using seven screens altogether, the FiberCloth M0 moves at a speed of 1.2-metres per second and offers the biggest possible projection surface, while also revealing the different scenes in the show. Puy du Fou turned to Modulo Pi to provide its video solution, with Cosmo AV providing the images and Christie projectors used, too. The Modulo Kinetic Designer is used for control, with eight Modulo Kinetic Vnode 4K feeding eight Christie 4K Boxer projectors and another Kinetic Vnode for four Christie 2K projectors. With such a original concept, the projections onto the seven screens were made by tracking the screen position based on OSC machinery, with the Modulo Kinetic system projecting both on the top and on the ground to provide truly breath-taking scenery. 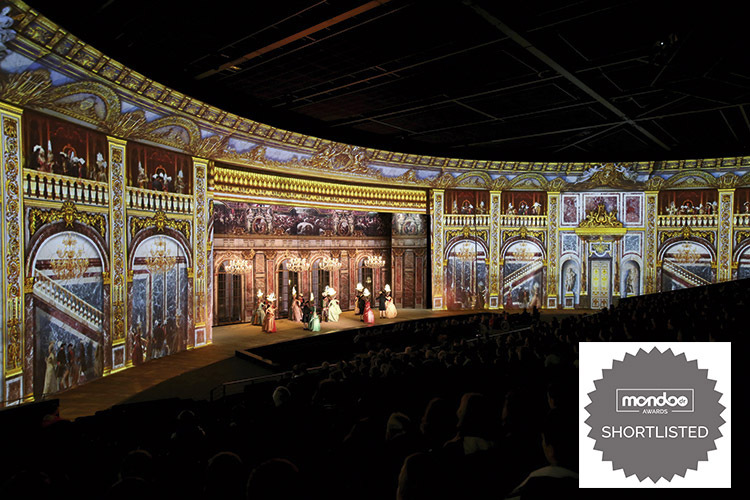 A sound-transparent projection surface was also required at Puy du Fou to achieve total immersion. New Mesh was provided by ShowTex for a black backdrop and stretched tight, with the sound source for the show mostly installed behind the fabric. For the sound source, L-Acoustics were on hand to provide a bespoke solution that would grip the audience as they watched Le Dernier Panache performed. Arnaud Delorme, the Applications Engineer at L-Acoustics, who worked on the installation at Puy du Fou, explained how the project came about: “L-Acoustics has been working with Puy du Fou, providing sound systems for their shows, since 2000. 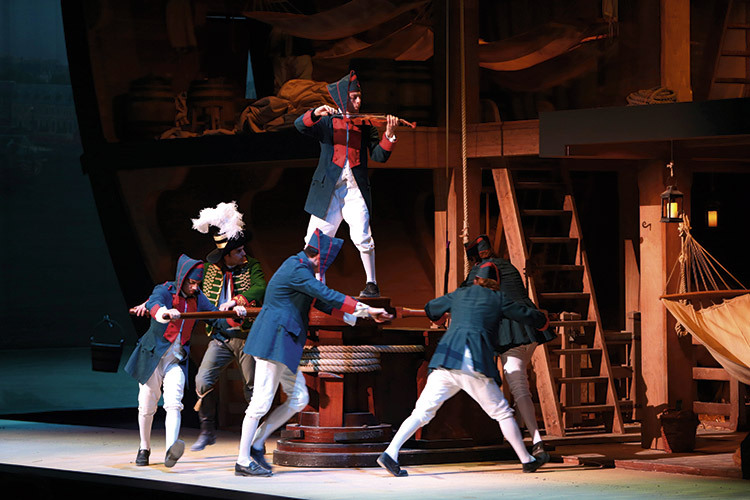 For the Le Dernier Panache, everything started when Nicolas De Villiers and his team had this ambitious idea for a show where the audience tribune would turn 360° from one stage to the other. “This idea introduced a new challenge for sound design which was: how can you keep a sound element in front of the audience while the tribune is turning. At the same time, Christian Heil was beginning the hard work that would lead to L-ISA many months later.” An L-ISA installation includes a Frontal speaker system to amplify the main scene area, with Scene speakers providing an accurate correlation between the sound and the position of the artists and Extension speakers to laterally extend the main scene and broaden the soundscape. There’s also the Immersive system, which complements the Frontal system, that is deployed around or above the audience to provide localised sound effects and the creation of an immersive sound experience through L-ISA algorithms. 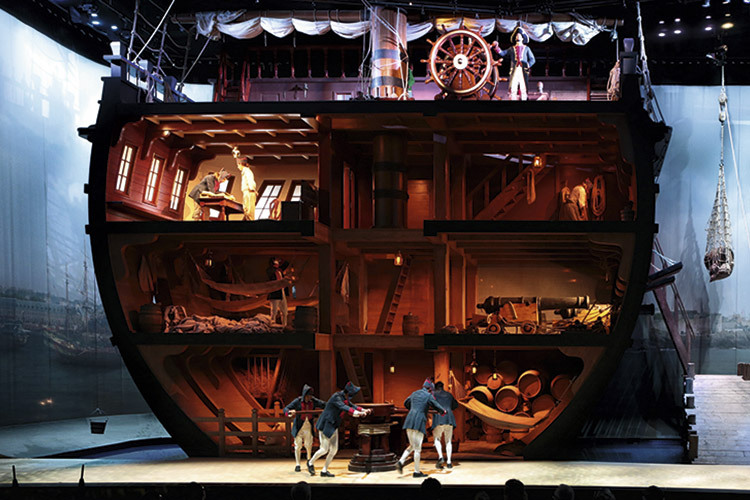 The incredible clarity and immersive experience that the innovative L-ISA system, along with the lighting, backdrops and video content, provides plays an absolutely vital role in the performance of Le Dernier Panache, enhancing the deep emotion of the show and gripping the audience throughout. It has to be said that the daring – almost unbelievable – Le Dernier Panache is a show that has taken Puy du Fou to the next level in terms of entertainment.